Printed circuit board ties are made from the same copper clad material used in fabricating electronic circuits. PC ties simplify crossing and turnout contruction since stock rails, guard rails and frogs can be soldered in place to hold gauge. PC ties are cut to length by the modeler using a razor saw, rail nippers, diagonal cutters or a cutting disc on a motor tool. PC ties can be used to replace every fifth wood tie in track work and thus eliminate hand spiking. Once everything is soldered in place, the copper can be cut between the rails, insuring that the rails are insulated from each other. 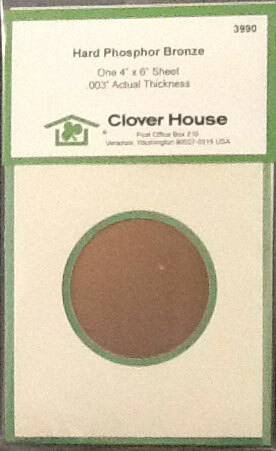 The substrate, or base material, holds everything in place after the copper coating is cut. 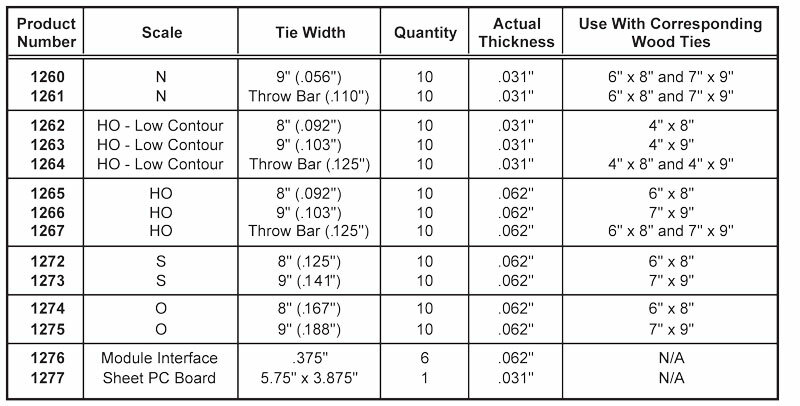 PC tie material comes in 12" lengths to minimize waste as the ties are cut to match the various lengths needed. Our PC ties strips are copper clad on both sides. One package of ten 12" long PC tie strips sheared to a scale 9" width (.056" actual) from .038 board. For use with scale 6" x 8" and 7" x 9" wood ties.